Samsung started rolling out the Android 7.0 Nougat update in India yesterday for the Galaxy S7 and Galaxy S7 edge. Well, with this update, Samsung has teased the launch of Samsung Pay in India. Soon after the Galaxy S7 and S7 edge were updated with Android Nougat, Samsung started teasing the launch of Samsung Pay in India. 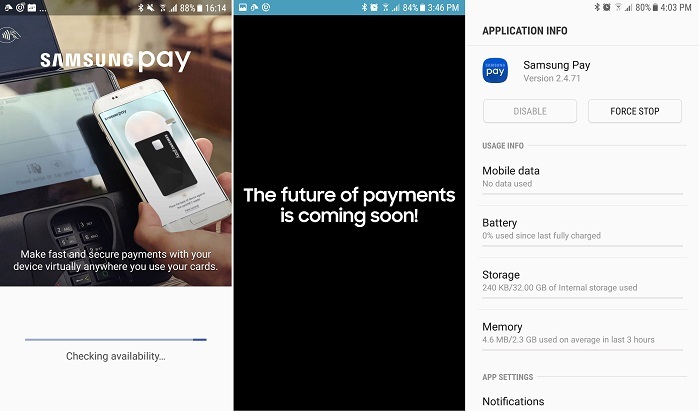 Samsung showed a message saying “The future of payments is coming soon!“. The Samsung Pay app can also be found installed after the Nougat update, which is proof enough that Samsung is gearing up to bring its payment service soon in India. Samsung Pay is similar to Apple Pay and Android Pay. The payments can be made from your smartphone by leveraging this technology which depends on NFC. Samsung already has a good stronghold in India, and, with the shortage of cash in the country after demonetization, mobile wallets like Paytm have benefited a lot. Well, Samsung surely would like to leverage this opportunity by bringing Samsung Pay in India. For now, there’s no information as to when the Samsung Pay will be launched and which banks will be supported.